GE's wind turbine at at Hundhammerfjellet wind farm in Norway. GE originally started looking at offshore in the 2000s, and in 2003 the company supplied 7 of its 3.6 MW wind turbines for the Irish offshore wind farm Arklow Bank. 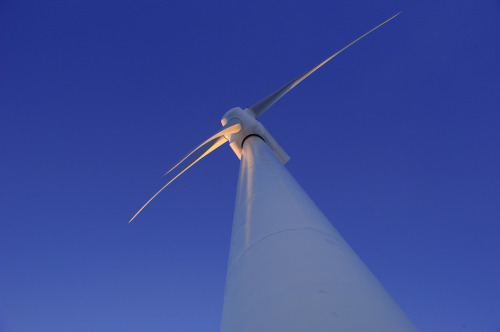 The wind turbine design is largely a scale-up of GE’s 1.5 MW turbine, Product Manager Offshore at GE, Vincent Schellings, tells Renewable Energy Focus. GE’s offshore focus was relatively short-lived, however. “We recognised that the offshore wind market was relatively small, so we withdrew from the offshore sector. But in the meantime we still owned that wind farm and we kept gathering information, data and operation experience. GE looked at various options, including in-house R&D, but decided in the end to buy ScanWind in 2009. ScanWind already had a 3.5 MW direct drive wind turbine with a 90 m rotor. A fleet of 14 units have been operational at Hundhammerfjellet wind farm in Nord-Trøndelag county, Norway, since 2005 in a high wind area (~9.2 m/s average wind speed), on a cliff, near the sea. Schellings says the conditions are almost like offshore, with difficult servicing and high turbulence. GE also built on the design of its 2.5 MW machine to for example mitigate the load increases with the larger turbine size with, amongst other things, single blade pitch control. Asked what the difference is between GE’s direct drive wind turbine, and other recently announced offshore wind turbines with similar technology, Schellings explains: “The difference with our turbine compare to the competition is: We have the only built for purpose offshore direct drive turbine. […] And with this design we have five years of operating experience. Through operating experience you learn a lot about the reliability of the design, you get the opportunity to improve it. So we got a couple of years head start on the competition for offshore direct drive applications. 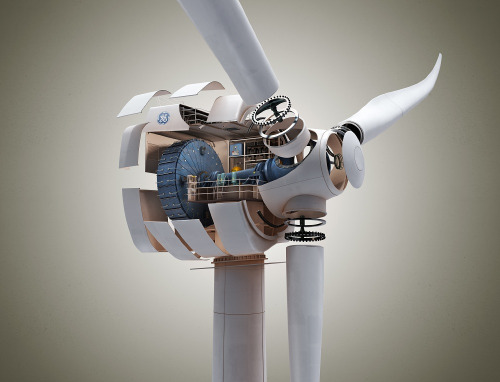 GE announced last July it is planning an onshore installation of its direct drive wind turbines in 2011. The offshore wind turbine will be erected in Gothenburg Harbour in Sweden in cooperation with Gothenburg Energy. “That version will mainly be used to validate the performance characteristics. […] And then next year, the goal is to put a unit in the water to demonstrate our installation procedures and commissioning procedures, as well as that the services concept works the way we plan it to work,” Schellings says. Permanent magnet drives are said to offer many benefits offshore over their geared counterparts in terms of maintenance requirements, but it is also known that the materials used for permanent magnet drives can be expensive. Asked what markets GE will promote its 4.1 MW offshore wind turbine to, Schellings says both the UK’s Round 3 and the expected French tender are of interest. “We go where our customers go, but obviously, the UK today is where most of the action is.” As GE has its offshore headquarters in Germany, Germany is also an attractive market. Looking towards the future, Schellings says: “We’re always looking for new technology, we are a technology company, but our focus is: What technology can we use to lower the cost of electricity? And the move to direct drive for offshore was because we think that if you look at the entire lifecycle of the wind farm, you will achieve lower cost of electricity offshore with a direct drive turbine.” Schelling ads that there might be better solutions out there that will become cost effective once built in larger quantities. Although technology may change with time, Schellings says GE’s approach to design stays the same: “We take a proven platform and then we build upon it.” For wind the opportunities for development usually lie around the rotor and the generator rating.